Curse of the Dark Pharaoh is an Egyptian-themed expansion for Arkham Horror that contains 166 cards. 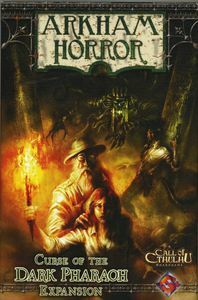 It is a part of the Arkham Horror Series. A museum exhibit has come to Arkham and can either stay as a permanent part of the base game (cards mixed in with original deck), or visit when you wish (cards kept separate). The expansion contains: 45 Arkham location cards, 27 new gate cards, 21 new spell cards, 7 new ally cards, 4 benefit and detriment cards, 18 "barred from neighborhood" cards and 22 exhibit item cards, representing the ancient relics from Egypt.